Knowing how to build cot bedding can be really helpful once you have a baby. It can save you a lot of money by not buying a brand new bedding while serve as an entertaining experience knowing you built something on your own. Of course, there are a lot of things to consider most especially because your baby will be using this cot bedding. Here are a few things to remember to ensure maximum efficiency and make sure that your baby will enjoy the cot bedding. When building or preparing such bedding, one must always remember the issue of safety. Sure, your bedding might be pretty to look at or soft to touch but if it is set in such a way that your little one would easily fall off or if the materials used would induce an allergic reaction, it would be a waste of time on many accounts. Always make sure that the materials used are strong and hypoallergenic. Go for blankets and swaddling cloths made of gentle materials that would not irritate the skin. More than aesthetic appeal for the baby and whoever is watching, functionality should remain on top of the list to remember when building such cot. Safety, specifically, should remain foremost above everything else. As aforementioned, functionality should be considered over aesthetic appeal and after the factor of safety, comfort should then be taken in consideration. Your little one’s crib should be as comfortable as humanely possible to ensure that he gets proper rest in between his meals and little toddler activities. An uncomfortable cot would not only interfere with his or her rest, it might even be a cause for deformation in your baby’s body, as their features are significantly more delicate in these formative years. When picking out accessories for the cot, make sure that you get the gentlest and most baby-friendly pillows, stuffed toys, or other bed playmates that would make baby’s trip to dreamland more pleasurable and relaxing. Apart from baby, you would also experience peaceful slumber because of the lack of crying and wailing. When the issues of safety and comfort have both been assured, one may begin focusing on the look of the bedding: the color scheme, the theme, and the off-the-cot accessories, among others things. Your child (and the people watching) would be treated to a wonderland of eye-candy with such colorful or themed cribs. There are a lot of themes and colors to choose from! For your toddler-princess, an all-pink ensemble of pink pillows, blankets, covers and cloths can be appropriated to induce that girly vibe. For your young adventurous son, on the other hand, a pirate theme may be formulated through the employment of colorful blankets, side dividers with accessory oars, mobiles of sales and other ship related trinkets and pillows and other stuffed toys shaped in ship materials. An astronaut theme is also a good idea with a spaceship shaped crib and chrome colored beddings. 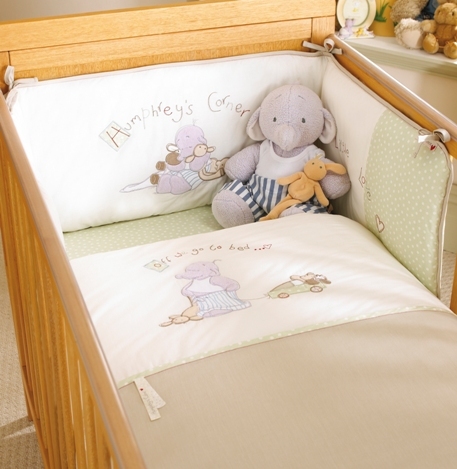 Let your imagination run wild and inspire your child through these cot designs. When building cots, always remember to prioritize safety and comfort above visual appeal. The point of all this is to ensure a sound sleeping space for your baby.